Sierra Dual Drawer Display - Cal-Mil Plastic Products Inc. The Sierra Merchandiser cart is constructed of reclaimed wood and a vintage-bronze painted metal. Each drawer includes liners and pulls out from opposite sides. 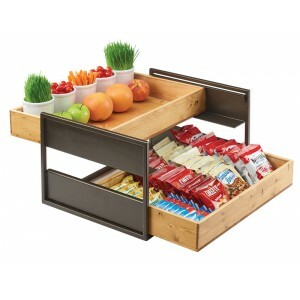 Great for displaying and selling individually packaged snacks and more.